Kitchen refacing can be a great way to restore new life to an outdated kitchen. Sure, complete kitchen makeovers are nice, but they can be extremely expensive and take weeks upon weeks to complete. Kitchen refacing from Vianvi Signature® Cabinet Refacing, on the other hand, can take as little as (3) days and be completed at a fraction of the cost of new cabinetry or a kitchen remodeling project. Chances are, your kitchen is full of cabinets, and they set the tone for the rest of the room, giving it an overall undesirable look if they’re worn and outdated. But, with the help of Vianvi Signature® Cabinet Refacing’s cabinet refacing service, those cabinets can receive a facelift in under a week’s time and give a positive light to your kitchen as a whole. The ability to make modifications to existing cabinets. Whether you’ve purchased new appliances that are different dimensions than your old ones, or you simply need more drawer space, Vianvi Signature® Cabinet Refacing can make virtually any changes to your cabinetry as part of your refacing project. 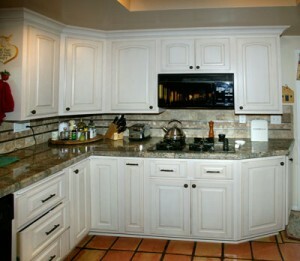 The ability to modify cabinets to allow for larger crown molding above your cabinets and throughout your kitchen. The customizations you can make with the above choices are essentially endless, with more than 3,000 cabinet refacing combinations in full. Not only will Vianvi Signature® Cabinet Refacing completely transform your kitchen to your one-of-a-kind specifications, but we will complete your kitchen refacing project in a timely fashion – as a matter of fact, your cabinets can be like new again in as little as (3) days. All Vianvi Signature® Cabinet Refacing dealers, manufacturers, and installers work quickly and efficiently while providing only the finest craftsmanship and customer service available, and a clean job site will be left behind upon completion of your kitchen refacing project. For more information about kitchen and bathroom cabinet refacing, or to receive a free quote, contact your nearest Vianvi Signature® Cabinet Refacing dealer today. Or, if you want to know how to become a Vianvi Signature® Cabinet Refacing dealer, contact us for assistance.